For over 40 years, Villa Palermo Pizza has been committed to quality food made with fresh ingredients. Our menu has a something for everyone including: appetizers, soups, sandwiches, pasta, ribs, veal, chicken, steak, seafood, pizza, desserts, and more! Open 7 days a week, we offer our full menu for pick-up and delivery (lunch delivery available Fri, Sat, & Sun). We also offer superior catering services daily, not to mention volume discounts for pizza orders. 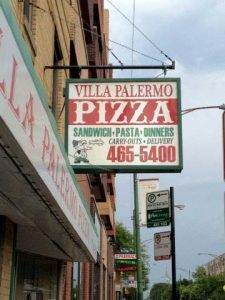 Come and see for yourself why Villa Palermo Pizza has been consistently satisfying appetites since 1969!